The general assembly enacted a budget for the 2017 fiscal year (July 1, 2016 – June 30, 2017) of $8.94 billion dollars. 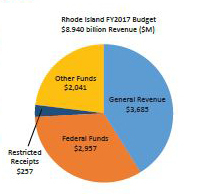 This includes $3.7 billion in general revenue funds, $3 billion in federal funds, $2 billion in “other” funds (such as the Unemployment Insurance Fund and the TDI fund) and $257 million in restricted receipts. 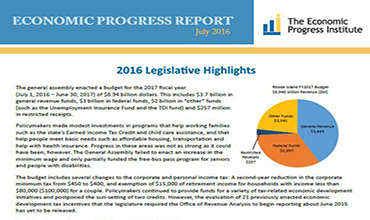 Policymakers made modest investments in programs that help working families such as the state’s Earned Income Tax Credit and child care assistance, and that help people meet basic needs such as affordable housing, transportation and help with health insurance. Progress in these areas was not as strong as it could have been, however. The General Assembly failed to enact an increase in the minimum wage and only partially funded the free-bus pass program for seniors and people with disabilities. The budget includes several changes to the corporate and personal income tax: A second-year reduction in the corporate minimum tax from $450 to $400, and exemption of $15,000 of retirement income for households with income less than $80,000 ($100,000 for a couple). Policymakers continued to provide funds for a variety of tax-related economic development initiatives and postponed the sun-setting of two credits. However, the evaluation of 21 previously enacted economic development tax incentives that the legislature required the Office of Revenue Analysis to begin reporting about June 2015 has yet to be released.